The common name "flamingo flower" actually refers to an entire genus of plant species; Anthurium is estimated to contain 1000 or more species with almost all of the diversity of this genus existing in the South American tropics. There are a few exceptions, but none of them are notable. Approximately 3/4 of the species known in this genus are either threatened or endangered due to habitat loss, which makes the entire group incredibly vulnerable to extinction. These flowers are actually remarkably difficult to grow from seed in a greenhouse, so plants in some locations were hunted almost to complete eradication for the international tropical plant trade. Now, ornamental species are grown in greenhouses and propagated from cuttings, which means two things: first, they are no longer collected in the wild (or at least very little wild collection), and second the populations grown in cultivation are all genetically identical. This could be devastating for the flower trade (and once again for the wild Anthurium populations) if there was a pathogen that invaded greenhouses and flower plantations and wiped out all of the plants because they had no resistance. 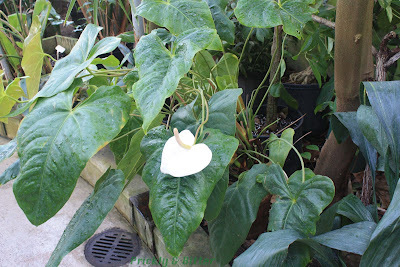 The Anthurium flower, like the Jack-in-the-Pulpit flower (which you can read all about HERE), is a specialized type of flower. 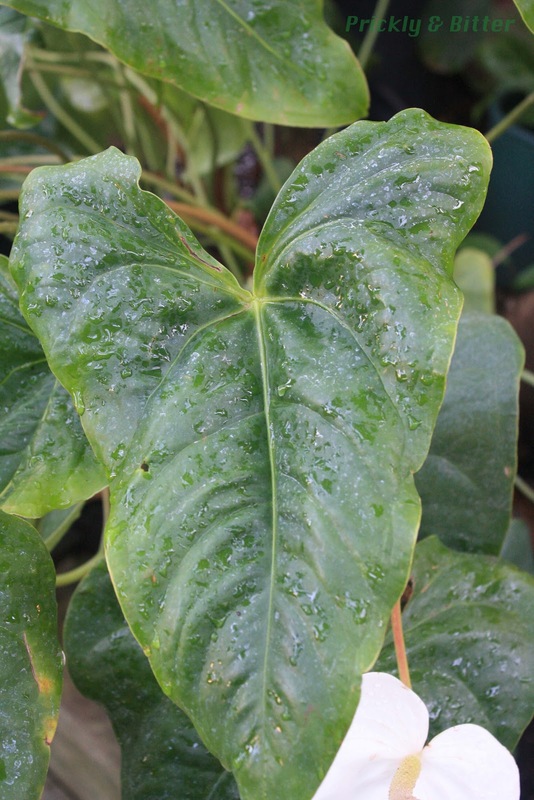 Anthurium species break all the rules when it comes to determining if a plant is a monocot or a dicot. Monocots have flower parts in multiples of 3s, and have long, narrow leaves with parallel veins. Dicots have flower parts in multiples of 4s or 5s, and have wide, broad leaves with net-like veins. Anthurium is a genus of monocots with broad leaves, veins that are somewhere between parallel and net-like, and have one inflorescence made up of tiny flowers that have their flower parts in multiples of four. Someone should tell these plants that they need to read more botany books to learn the rules! 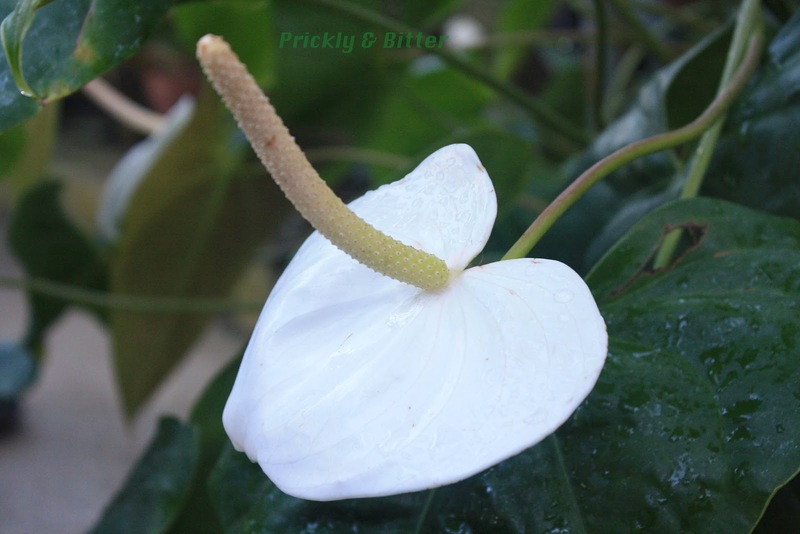 Anthurium flowers are made up of two parts: the spathe, or the white shield-like petal surrounding the rest of the inflorescence (its role is to attract pollinators), and the spadix which houses all of the tiny little flowers (thousands of them less than 1 mm across!). On the bright side, we've made up a new rule concerning the ways to tell monocots and dicots apart when the plants refuse to read books: whenever you see a plant with an inflorescence made up of a spathe and spadix, it's always a monocot!